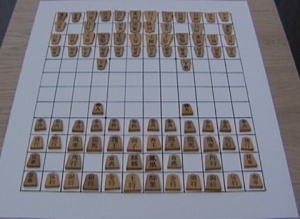 Chu Shogi, the ancient super Chess game. When ancient Persian Chess came to Europe, it was an exceedingly boring game by modern standards. There were no Queens and Bishops, they were replaced by a General that crawled over the board one diagonal step at the time, and Elephants, which made diagonal jumps of two squares, and thus skip over almost every square of the board. Around the year 1350, however, the modern Bishop was added to the game (and the board expanded to 12 x 8 to make room for it). This variant, called Courier Chess, became quite popular in Germany. It also introduced a piece next to the King that moved like a King, but was non-royal (on the other side of it as the Persian General). The new pieces caught on, and replaced the boring General and Elephants also in the 8 x 8 game, where the non-royal King took up the role of Queen. Then the Italians extended the range of the Queen to the entire board, thus 'inventing' the modern Queen. This variant, known as 'Mad Queen Chess', subsequently conquered the world, and became our present-day Chess after a few minor tweeks of the rules (such as castling, en-passant capture). About one hundred years earlier, however, another branch of Chess underwent a similar expansion and contraction in Japan. Like in Europe, this evolution culminated in a quite advanced high-pace game, which next to the ubiquitous Rook also involves Bishops and Queens! This game, Chu Shogi, was derived from the earlier Dai Shogi, which was played on a 15 x 15 board, by leaving out the 8 weakest piece types (which each occurred twice in that game). This allowed shrinking the game to a 12 x 12 board, for a further increase of the pace of the game. how a piece moves from the depicted shape. A Queen, however, was not the strongest piece in Chu or Dai Shogi. This role was reserved for the 'Lion'. At first glance an innocent piece, as it can move at most over a distance of 2 squares. But it can jump directly to any square within this distance of 2 (which makes 24 targets), which in itself would make it already worth more than a Queen (nearly 11, with the usual Q=9). But the Lion can also do its move in two steps, each step being the move of a King. And both of these steps can be captures. So a Lion can capture two pieces in one turn, but it can also capture a piece next to it, and then withdraw to another square, possibly even the square where it came from! Protecting pieces in the usual Chess manner thus does not help against Lion contact attacks. The enormous power of the double-move makes the Lion worth about 15, i.e. 66% more than a Queen. It will probably not come as a surprise that a piece as powerful as the Lion will dominate a game of Chu Shogi, and keep the pace of the game high, just as the Queen dominates a game of Chess. A game of Chess just isn't the same after the Queens have been traded. To make sure this aspect does not get lost early in the game, by trading Lions, a special rule was developed for Chu Shogi to prevent such trades, or at least make them very rare. The rule consists of two parts: a Lion is not allowed to capture a distant (= non-neighboring) Lion that is protected (so that the opponent could recapture, and the result would be a Lion trade). A Lion can capture an unprotected Lion from a distance, to minimize the possibility of abusing the rule for offensive purposes. The second part is to discourage indirect trades: if a non-Lion captures a Lion, on the immediately following move, you are not allowed to do the same. So answering an attack on your Lion by a counter-threat on his Lion (making it a trade) will not work: your Lion will be captured, and then you are not allowed to retaliate against his. There is no rule against a Lion capturing a protected Lion at close range, but this is usually not a trade, because the Lion double-move in such cases allows the capturing Lion to withdraw with its second step, to one of the 8 neighboring squares, and it will usually be able to find a safehaven there. Capture a protected distant Lion is also allowed when you do it in two steps, first capturing something else of significance on the way to it (so not merely a Pawn or Go Between). But this would also not be a pure trade, because of that extra captured piece, so the opponent would strive to avoid it anyway. A rather unique feature of Japanese Chess is that promotion is not just reserved for Pawns. Almost all pieces can promote, although usually not to something enormously stronger than they already were. (Remember that in Persian Chess a Pawn also promoted to the rather worthless General, barely worth 2 Pawns, and that only in the Mad Queen variant promotions became all-decisive.) In addition, promotion does not take place just on the last rank, but there is a promotion zone that comprises the entire enemy camp (i.e. starting at the rank where his Pawns start). There is no promotion choice like in Chess, however: each piece can only promote in one way (and only once). It can defer promotion, though, but only as long as it can still move further in unpromoted form (so Pawns must promote when they reach the last rank, as otherwise they would be stuck there). Sometimes that makes sense, because even though pieces are in general weaker than the piece they promote to, the latter need not always be fully upward compatible with the original piece. And in such a case you can always promote later, because you are allowed to promote after every move that starts or ends in the promotion zone. Chu Shogi has the special rule, however, that a piece that defers promotion, cannot promote on the very next move, unless it captures. Chu Shogi has pieces of 18 different types that cand promote, to 18 other piece types. (That makes 36 piece types for each side!) Superficially there is some overlap between the promoted and unpromoted pieces: e.g. amongst the promoting types there are the 'Gold' and the Rook, but the Gold also promotes to a Rook. That latter Rook is not promotable any further, though, while the original Rook can promote to Dragon. So they are not truly the same piece type, and the unpromoted Rook is more valuable than the promoted Gold, because it holds the promise of further promotion. If we disgard differences in promotability, but only look to how the piece moves, Chu Shogi would have only 28 different piece types. Still a lot, compared to the 6 piece types of modern Chess! The least valuable piece in Chu Shogi is the Pawn, but you have 12 of them. They can only step straight forward, (as usual for Pawns) and capture that way too (like in most Asian variants, but unlike western Chess). In fact all pieces always capture as they move in Chu Shogi. In front of the Pawns the initial position contains two 'Go Betweens', positioned as outposts, which are basically bi-directional Pawns. These are also hardly worth anything, but are presumably there to help passifying the opening position by closing diagonals against the opponent's battery of diagonal sliders. With very few exceptions, Chu Shogi uses just two move types: single steps to a neighbor square, or infinite-range sliders that move arbitrarily far along orthogonals or diagonals, until they encounter an obstruction. The King moves exactly the same as in Chess, 1 step in all of the 8 direction. The weaker Chu pieces, starting on the back-rank, are basically handicapped Kings, moving one step in most directions, but not all. Their move patterns are asymmetric, mostly aimed forward, but with different blind spots on the side or rear. They can be used to build a fortress around the King (the Pawns start to far forward to be of any use as a Pawn shield, and because they lack diagonal captures, they cannot protect each other, and would not form much of a shield anyway). But in the end-game, when material has dwindled to the point where a strong fortress is no longer needed, they can join the attack and attempt to promote to sliding pieces. When they manage to join the attack in the middle game, they can be dangerous forkers, much more so that Pawns in Chess: in general they attack all three squares in front of them, and their ability to make sideway or diagonal non-captures makes them quite agile. 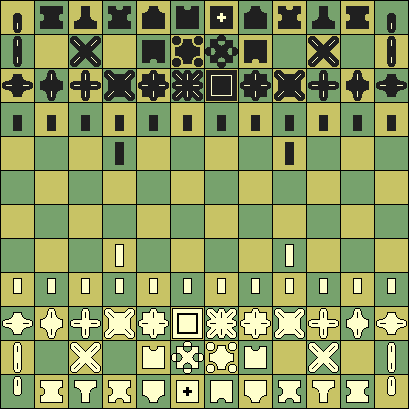 The rank directly behind the Pawns, as well as the edge files, contain sliding pieces. The weakest of those are the Lances in the corners, which move only forward. So they can never leave their starting file. But if they are not traded, they will finally promote to a White Horse: a slider that can move (diagonally forward) to other files. The 'Reverse Chariots' in front of them are similarly confined to their starting file, but can also withdraw along it. Together with the Lances they form a nice battery. And they also promote to a piece that can move to other files. So there always is an interesting battle on the very flanks, to make a breakthrough to open up the promotion zone, so your important pieces can enter it. The 3rd-rank pieces do not suffer from confinement to a single file, rank or diagonal, but have moves in each of the two board dimensions. The Side Mover and Vertical Mover suffer from 'quasi-confinement', though, as they slide in one dimension, but step excruciatingly slow in the orthogonal dimension. They promote to much stronger pieces, basically Queens missing moves along one file or one rank, which thus are very mobile. But especially the Side Mover will be very hard to promote, and can better be used to guard your own camp against (promoting) intruders. Then there are the more familiar Rook, with behind it the equally familiar Bishop, and in the center a single Queen, next to the already discussed Lion. But there are some pieces in between Rook and Queen, in position as well as value, namely the 'Horse' (moving as B+K) and 'Dragon' (a R+K compound). Like the Queen, these are very strong pieces, because they have no blind spots where a Lion could approach them, to threaten a hit-and-run capture. Bishop and Rook promote to them, i.e. they get the extra King moves they did not have yet on promotion. Lion and Queen are two of the three non-promotable pieces in the initial position. Winning the game, and what about a spare King? You can also get a second instance of the other non-promotable pieces. The 'Unicorn' (often referred to by its Japanese name, 'Kylin') and the 'Phoenix' promote to the Lion and Queen. These pieces have the rare property that they can jump over occupied squares. (There is no Chess-style Knight in Chu Shogi.) They are similar in strength to the Chess Knight, attacking 8 squares with unblockable attacks, which makes them rather weak as Chu pieces go. (But they are about 50% stronger than the back-rank pieces, which attack only 5 or 6 squares). Their very powerful promotions make them valuable, though, so it is probably best to keep them in the rear guard until they can be safely promoted. The Horse and Dragon also promote to pieces not present initially, the Falcon and the Eagle. These move like Queens, except that in one (Falcon) or two (Eagle) forward directions the sliding move of the Queen is replaced by a double one-step move that has to stay on the file or diagonal. This is very similar to what a Lion can do (except that the latter can step off its initial ray), and also allows a direct jump to the second square (over an occupied square), hit-and-run capture to the second square, (capturing two pieces), or back to the initial square, or moving back to the starting square without capture (effectively passing the turn). This all sounds so wonderful that this could likely make them stronger than a Queen. Unicorn - steps diagonally, jumps 2 squares orthogonally Lion - makes 2 King moves per turn, or steps/jumps to any square in that reach. The WinBoard graphical Chess interface now supports Chu Shogi. At least, the Alien Edition does, because Chu requires double moves and turn passing (not implemented in the standard edition). Perhaps the standard version of WinBoard will be equiped with alternative methods to satisfy the needs of Chu Shogi in the future. There is currently one WB engine that plays Chu Shogi, called HaChu. Its beta version is bundled with the WinBoard Alien Edition, and the package can be downloaded from here.